See major article about the Tangaroa in our Winter 2006 issue. When Great Grandma Etta (Creighton) was in the fifth grade more than 70 years ago, her class made a model of a Viking ship. Not long afterwards, Thor Heyerdahl launched his Kon Tiki balsa raft from Peru across the Pacific (1947). In 2005, Etta learned that Heyerdahl's grandson Olav would be on the crew of Tangaroa, another raft following the Kon Tiki voyage. That's when she decided to see it for herself. And off she went with her great grandson Nick Conklin to Lima. Left: Great Grandma Etta (Henrietta Creighton) who was determined to track down the Tangaroa. She found her way to Peru from New Jersey and took her grandson Nickolas Conklin (below) to watch it launch in April 2006. Etta notes that teens these days mostly hide behind hair in their eyes, wear baggy pants and hardly know what's going on in the world because they're constantly playing around with electronic gadgets. She wanted to "light a fire under her great grandson" to inspire him and so they made the trip. In the process, it seems that Nick discovered that he is a great photographer and a savvy traveler with a keen eye for "digging" into ancient history. Thanks, Thor Heyerdahl and Tangaroa! 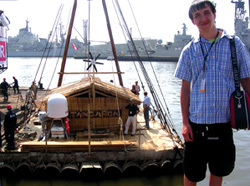 The Tangaroa voyage was inspired by archaeologist Thor Heyerdahl's Kon-Tiki expedition across the Pacific in 1947. Higraff, the Expedition Leader of the Tangaroa, along with his crew (including Heyerdahl's grandson) made the 4,000-mile oceanic journey from the coast of South America to the Polynesian Islands in a record-breaking 70 days. The couple had spent their honeymoon in 2003 in Ecuador in search of balsa logs. Azerbaijan International published a major feature about the construction of the Tangaroa and the rationale for the journey in the Winter 2006 issue (AI 14.4). See "Tangaroa: Pacific Voyage. Testing Heyerdahl's Theories about Kon-Tiki 60 Years Later." Search Tangaroa at AZER.com. Azerbaijan International joins the Higraffs in welcoming Paula into the big, grand world of adventure and discovery of her parents. Left: Tangaroa balsa raft, whose six-member crew led by Norwegian Torgeir Saeverud Higraff, crossed the Pacific in Spring 2006. Both Heyerdahl and Higraff had been several times to Azerbaijan where they have good friends.